When Neil Armstrong and Buzz Aldrin landed on the moon nearly five decades ago, the pair responsibly gathered up their trash before embarking on the historic moonwalk. Armstrong was the one to handle the final act of the oft-dreaded chore, taking the trash out to the lunar curb. The white bag known as a “jettison bag” or “jett bag,” contained a variety of waste from the Apollo 11 mission, from wrappers to human waste. You can even see the familiar-looking trash bag in the first photos taken on the moon that day. Nearly five decades later, we’ve left more than 100 man-made items, amounting to 400,000 pounds, on the surface of the moon. Some are commemorative, like plaques, some are there because we needed a place to put them (the aforementioned human waste), and others just needed a place to crash—literally. Wrecked lunar probes, American flags, golf balls, blankets, empty space food packages, a gold olive branch, a Bible, and a falcon feather are all gathered there. (You can actually see much of the trash from 13 to 15 miles above the moon's surface.) But all that lunar junk is nothing compared to the total amount of waste humans have sent careening into deep space. As unfortunate as it might seem, litter in our solar system is the price we have to pay for discovery. The good news is it’s actually not all left to float out among the stars forever. Much is expected to reenter Earth's atmosphere and burn up. Since the mid-1960s the fate of these discarded materials has been documented by the Department of Defense, and many pieces of refuse have done just that, while others became stuck in Earth’s orbit for a while before plummeting. More than 21,000 pieces of such debris are circling the planet right now. 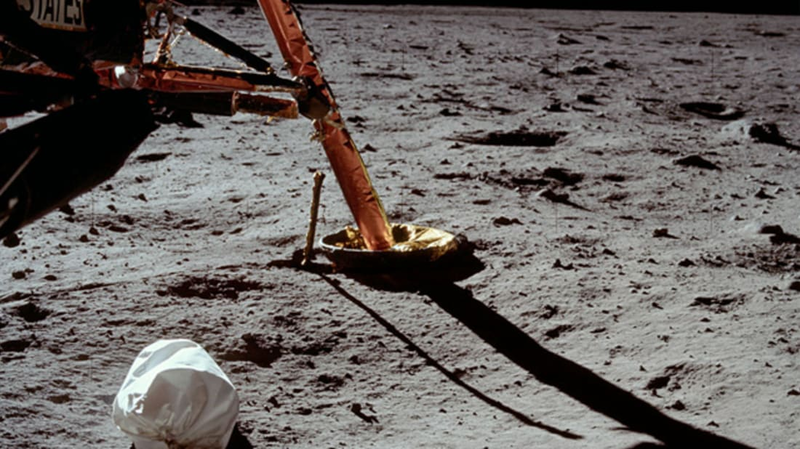 If environmental guilt is starting to creep in, take solace from the fact that lunar littering is at least legal, as the international 1967 Outer Space Treaty doesn’t contain any laws against it. Plus, the materials we leave behind might even provide a good window into humanity for any alien races who stumble upon them. For better or worse, the trash is part of a legacy. Alongside the gross stuff, space explorers have left far more poetic representations of Earthlings on the moon, including an urn with the ashes of Eugene Shoemaker, a planetary geologist who had dreamed of stepping foot on the surface of the satellite. Inscribed on the memorial are lines from Shakespeare's Romeo and Juliet.